Letters From A Tapehead: Ufomammut: "Lexon"
New artwork and trailer have been revealed for Ufomammut's upcoming release, Opus Alter, part two of the band's Oro series. I know I've posted this before, but Ufomammut's Opus Primum, number one in the Oro series, was reviewed at Stereokiller. The second installment of UFOMAMMUT's two-part ORO album series -- ORO: Opus Alter -- has been previously confirmed for North American release on September 18th via Neurot Recordings, and today more details on this gargantuan LP have arrived. Today the full track listing for this new chapter has been released, as well as the intriguing cover art brought to you once again by the unstoppable force that is the Malleus Art Collective. Additionally the band have continued their tradition of visually presenting each track from the ORO series with their fans, and today have unveiled the album's second hymn, "Luxon" in full video style. View the artwork, "Luxon" video and more epic documentation of the UFOMAMMUT sorcery we have come to expect from the pummeling Italian sludge unit AT THIS LOCATION. 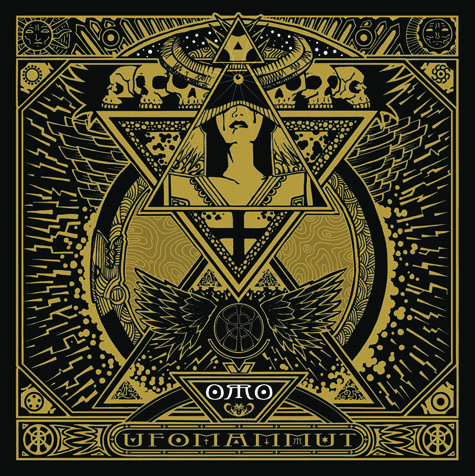 As with all previous UFOMAMMUT albums, the concepts behind ORO are expansive and multi-faceted, mutating the Italian palindrome which translates to "gold" with the Latin translation of "I prey." ORO explores the concept of knowledge and its power; the magical stream controlled by the human mind to gain control of every single particle of the world surrounding us. ORO is the alchemical process to transform the human fears into pure essence; into Gold. Although ORO's two chapters will be released months apart from each other, they must be considered as a single track in which the musical themes and the sounds appear and reappear, mutate and evolve, progressively culminating in the crushing final movement. ORO is an alchemic laboratory in which substances are flowing, dividing and blending themselves in ten increments from the alembics and stills, culminating into the creation of Gold. Opus Alter is going to fulfill and widen the perspective of the new work of UFOMAMMUT. Starting where Opus Primum ended -- the album released as well by Neurot in April of this year -- Opus Alter evolves deeper into devastatingly powerful new territory, where chaos is metamorphosed by cacophonous sound, until the final notes resonate, knowledge is forged and the band strike gold. UFOMAMMUT are continually updating their tour itinerary, having new performances confirmed across the European continent for the months ahead, with plans coming together to bring their otherworldly mammoth sludge magic across the Atlantic in the near future.